This discussion paper presents a summary of the findings of Mott MacDonald’s energy economics team on the potential for cost reduction in CCS in the power sector in the UK. 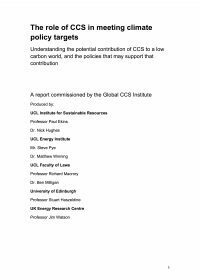 The paper is intended to stimulate further thinking, particularly through the CCS Cost Reduction Task Force. This paper identifies the main activities that could potentially drive a reduction in the cost of commercial scale CCS and estimate the scale of any potential cost reduction, focusing on the near to medium term. It comments on how CCS affects power generation costs, reviews how other studies have approached cost reduction and discusses bottom-up projections of the scope for cost reduction across the main technology routes. The United Nations Industrial Development Organisation and the International Energy Agency are developing a Global Technology Roadmap for CCS in Industry (the Roadmap), due to be released mid–year. The project has been sponsored by the Global CCS Institute and the Norwegian Ministry of Petroleum and Energy. The Roadmap will be a valuable resource to stakeholders, including policy makers and regulators, across the globe. Targeted at policymakers, the Roadmap will be a high-level assessment of the key actions and milestones that need to be undertaken to develop CCS in Industry. The following in-depth, technical sectoral assessments have been undertaken to inform the direction of the Roadmap.